These felted napkins rings are sure to bring some color and fun to your dinner table. Measures approximately 3.5" diameter, with 2" diameter ring; 4 pack only, colors as shown. Handmade in Nepal. Global Crafts is proud to provide Global Groove products. 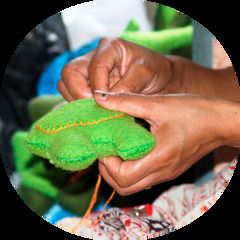 Global Groove is an independent Fair Trade company and member of the Fair Trade Federation. All products are sold at the same wholesale price as on the Global Groove wholesale web site. This initiative provides our customers with an easy way to add Global Groove products to your store without the worry of ordering from two companies and meeting minimum orders.